Hallmark's itty bittys are super cute and offer big fun. These stuffed animals are ideal for collecting or playtime; they’re durable, cuddly, and come in a variety of favorite characters including, Marvel, DC Comics, Star Wars, Wizard of Oz and more. These little characters are perfect for kids and adults alike. They’re perfectly sized for little hands, and you can buy collector’s sets that include four limited-edition characters. They make a fun collectable that once you start you will want them all. They measure 3 inches wide, 4 inches high and 2.25 deep so perfect size for perching in all sorts of places. An Itty Bitty would make a great thank you, birthday or even Valentines gift, a charming gift or collectable that will not break the bank. They are incredibly cute and well made so you know they will be safe in your little/ loved ones hands and I am sure they will not be put down. I have been sent a 'wizard of oz collection to review and they are just as cute to hold as they are in the pic, my four year old girl absolutely adores them, she is really into imaginary play and has been watching the Wizard of Oz over the Christmas holidays so was soon into recreating the story line with her Itty Bittys, having hours of fun with them. They are small enough to pop into one of her many bags to take on car journeys or when visiting family, so I am sure will be popular a long time to come. Big fan of Wizard of Oz, the little ones would love this set! These are lovely! Thank you for the giveaway! The best I've seen of these! Great prize, would love to win these. 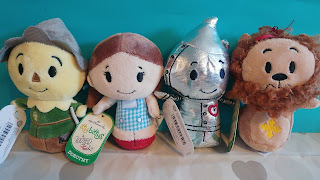 These Wizard of Oz Itty Bittys are adorable.I'm sure my son would love collecting them especially since they also do Marvel and DC Comic charactors. These are great! My kids would love them! These are fab! My boys would love them! Those are possibly the cutest things ever! My Granddaughter would love these. My young nephew would love one of these. Great giveaway. Thanks for the chance. These are great and so very portable. Cute too. Never seen these before, so sweet would love them. The Wizard of Oz is one of my fave films!! Wizard of Oz was always a Christmas staple movie as a kid, would love to have a reminder of that in cuddly form! I love itty bitty's. Fingers crossed. I grew up watching The Wizard of Oz every year on television. This reminds me of my childhood. I'm a big fan of the Wizard of Oz. Amazing Prize!! Thanks for the chance! Fab collection, thanks for the chance. We have some of the super hero itty bitty's, These ones are just so adorable. I can't wait to see what new ones are released this year. my daughter would adore these, they are adorable fingers crossed as i would love to win them. We've had our eye on Itty Bittys for ages. Very cute indeed. These are so cute, would love these . I absolutely love these! Me and my daughter are massive Wizard of Oz and Wicked fans so this would be amazing for her! Love Wizard of Oz and I love Return to Oz too . I would love these in my life!!! The Wizard of Oz is my all time favourite movie!! These are so cute; I'd love to start collecting them. Omg, These are awesome. I love the wizard of OZ!